In Times is a rather incredible thirteenth album from the Norwegian legends – incredible not just for the band's longevity, but in its own right as a very good album. Each new album that the band releases seems to outdo the previous one (with the possible exception of 2012's RIITIIR, which I loved but can see the argument that it was a bit bloated and self-indulgent) and I look forward to new albums from the band as Sure Things, yet In Times is good enough to suggest an altogether new plateau of quality for the band. Of the six tracks here, all over eight minutes in length, not one is below-par, and not one feels unnecessary or like filler. Opener Thurisaz Dreaming hearkens a step back in time to the band's ferocious past, driven by Grutle Kjellson's screeches before a breakdown leads to a blackened trip that melds both the band's lighter Floyd-influenced side and the perfect metal of Below The Lights into a tumultuous union. It's a hell of an opener, and immediately enough to dispel the few negatives I felt about the band in my review of Axioma Ethica Odini – the clean vocals here are far from cheesy, for example, and feel perfectly natural, especially alongside group singing and a chaotic piling on of different vocal styles that fits in well with the more blackened approach here and there. 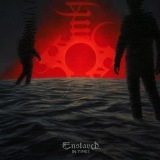 Yes, this is the first Enslaved album in a while that I feel comfortable using the b-word around. The band are still beyond the genre, and the flimsier 'Viking metal' probably closer to their sound nowadays (just listen to that Bathory-esque rocking riff that opens Building With Fire!) but their roots in it are plain here like never before. The widespread usage of rawer, powerful riffing works very well alongside moments of proggy melody, and the speed and blunt force of the band as a metal unit. Look at One Thousand Years of Rain as an example, the opening clean guitars almost post-rock before Grutle's snarl introduces the heaviness, a mixture of melodies powered by thrashy riffing that seems dominant without drowning out the complexities. The tempo and sheer heaviness of the song is way beyond that of prog metal, and structurally it's closer to something more extreme, even if the clean vocals and melodies drag it above ground. And again, those group vocals are straight off Below the Lights, probably the band's best-loved album among the devout. Much of In Times could have come from that album. The title track (at over ten minutes long the lengthiest on the album) opens with wordless background singing and builds riffs to a distinctly early-2000s underground proggery that seems a perfect callback. Yet it's remarkable that despite mainly sticking to a sound that is unmistakeably Enslaved, the band still find time to surprise you. Nauthir Bleeding's opening, for instance, is tech-metal given a Norwegian overhaul, jazzy percussion and carefully layered guitars interposed with blasts of heaviness that eventually takes over and leads you from the riff worship of yore to the layered atmospherics of Axioma Ethica Odini, past and present working extremely well together (not surprisingly given the core of the band now is the same as 2003– Kjellson, Ice Dale and the always underrated Ivar Bjørnson). Sure, some may scoff at the thought of a band repeating itself as a positive thing, yet by mining their past Enslaved are taking from the best, and by melding it to the present they've formed quite a terrific album. It takes a few listens to really unlock, of course, but each one is a delight, that lovely knowledge that what you're hearing is a band at the top of their game and every time you hear it you'll love it a little more. That feeling comes often when I listen to Enslaved, despite their relative prolificity – sure, perhaps less would be a little more, and an album as good as In Times once a decade would be enough. But they've long been my favourite Norwegian black metal act despite the relative lack of black metal compared to others, and you can't have too much of a good thing. Well, In Times isn't just a good thing, it's a surefire lock for my year-end list and quite possibly the best thing I'll hear until then. (I always feel like I undersell bands a little, being too reticent to tell you when I really like an album; take it from me, Building With Fire alone is the best song the band have written in years, and the rest of the album isn't far behind. I haven't even mentioned the weird little industrial interludes that start and end songs here, or the stunning artwork - this is truly a fantastic album).